NASA scientists have released new findings about the moon’s tenuous exosphere – the thin layer of gas surrounding the moon that’s one 25-trillionth the density of Earth’s atmosphere. The data reveal, for the first time, that meteoroid strikes cause a predictable increase in the abundance of two key elements within the lunar exosphere. Physical processes such as meteoroid stream impacts, the bombardment of helium and hydrogen particles from the sun, thermal absorption, and space weathering constantly modify the moon’s surface as they work within the lunar exosphere. NASA’s Lunar Atmosphere and Dust Environment Explorer, or LADEE, spacecraft observed an increase in exospheric gases when the rain of meteoroid impacts increases during a stream. These interplanetary grains can hit the lunar surface at speeds exceeding 21 miles (34 kilometers) per second, releasing immense heat, and vaporizing part of the soil and meteoroids themselves. Within this vapor are sodium and potassium gases. LADEE’s Ultraviolet Visible Spectrometer (UVS) instrument measured levels of sodium and potassium around the moon every 12 hours for more than five months. These frequent readings revealed a dynamic rise of gas levels in the exosphere as meteor streams bombarded the moon, with the concentrations of both elements returning to normal background levels after the stream passed. Interestingly, the time it took to return to “normal” was dramatically different for the two gases, with potassium returning to its pre-shower state within days, while sodium took several months. The findings are being presented at this week’s meeting of the American Geophysical Union in San Francisco and appear in the journal Science. Researchers will incorporate these observations into exosphere models of the moon and similar bodies to help NASA unravel the mysteries of how our solar system originated and is changing over time. A majority of bodies in the solar system are small and are considered “airless,” with exospheres in place of dense atmospheres. Our moon, icy moons within our solar system, the planet Mercury, asteroids and even Pluto are examples of small bodies with known exospheres that start from their surface – surface-boundary exospheres. Larger bodies, such as Earth, also have tenuous exospheres as the outermost layer of their atmospheres. Our moon can act as a nearby laboratory for learning more about both the soil composition and the processes active in the atmospheres across our solar system and beyond. LADEE was launched in September 2013 and orbited the moon for about six months. 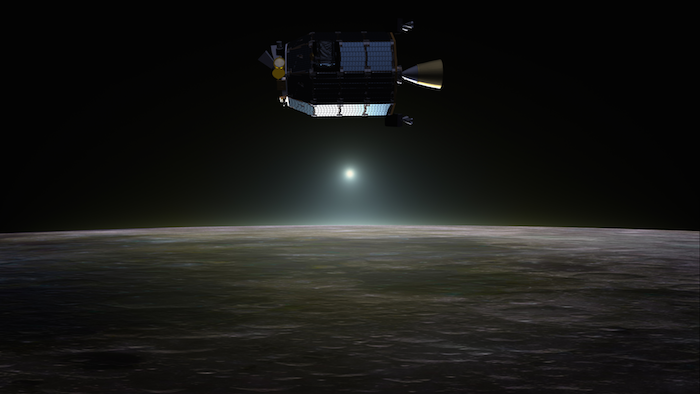 The robotic mission orbited the moon to gather detailed information about the lunar atmosphere, conditions near the surface, and environmental influences on lunar dust. Ames was responsible for the LADEE spacecraft design, development, testing and mission operations, in addition to managing the overall mission.